As I write this I am sitting in an evacuation center in Shizugawa. There are a little over 120 people staying in the karate dojo of this high school. There is no running water, no electricity. A generator outside provides electricity for heat, and trucks bring in water - but there is not enough to shower or bathe. Instead people are using wet wipes of any kind to keep themselves clean each day. Everyone gets to go to a separate location every 15 days for a bath. Each family has their own little space, about the size of a king bed, for sitting, eating, and sleeping, and their few belongings are in boxes around them, forming a kind of wall between them and their neighbors. As you walk down the aisle in the middle of the room, you can almost imagine you are going past houses on a neighborhood street, but all in one big room. Are you wondering why I'm here? This morning I woke up and thought about where we had been and what we had seen, and about the fact that we've spent most of our time driving around, looking for gas, loading supplies, and making deliveries, but haven't spent much time with people. I thought, wouldn't it be great if we had the opportunity to spend time in one of the evac centers, just talking with people? I mentioned the idea to my team, and one of the others, Roger, seemed open to the idea as well. So I prayed about it, asking God to bless us with the opportunity - and He did! 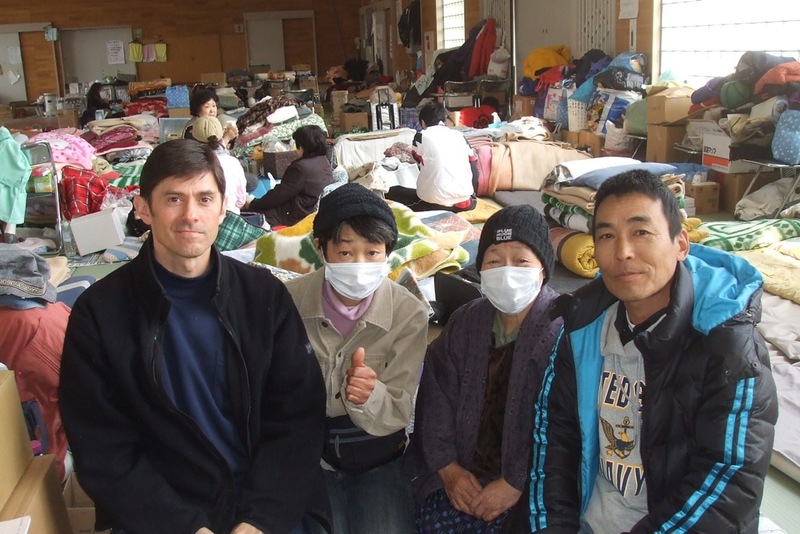 We returned to Shizugawa with more supplies today (socks and underwear were the highly sought items). The man who oversees the second evac shelter has been extremely friendly and helpful, and today he invited us into the main hall where everyone is staying and introduced us. He the asked us to each make a short introduction in English, and invited the residents to ask us questions. When we asked him if we could circulate around and talk with people individually, he readily agreed and announced that we would be doing that. There was a group of Japanese volunteers with us today also, and they soon had a small group of children around them and were happily playing away with them. Roger and I went around and talked with a few of the adults there, making introductions and listening to their stories. Eventually the rest of the team left, but Roger and I stayed to talk with the people here. Pretty soon it was supper time and we we invited to stay, then it began to get dark and we were allowed to stay the night. It all happened so naturally and easily! We had some great conversations - one of them was with an 82 year old man, and Roger prayed with him at the end. Japanese are usually quite willing to have someone pray with or for them. I learned more about how the tsunami had devastated the town. There was a 5 story hospital near the beach, and the tsunami swept through up to the 4th floor. Only those on the 5th floor survived. As the tsunami flooded inland, the valley narrows, and the water built up. At the far end of the valley, the water had surged 35 meters high - that's about 110 feet. The whole town from the ocean to that point went underwater and got swept away. Everyone here has a story. Everyone here has experienced great loss - home, car, possessions, livelihood, and in some cases, family. It was so very good to be able to listen to a few of those stories, to pray with them and encourage them with our presence, and to tell them about the many others, like you, who are concerned for them. Thank you, Lord, for blessing me with this unique experience. Thank you for allowing me the privilege of telling others about your power and love, and that you hear and answer prayer.